For a while there we thought our senior beagle Cricket’s ball playing days were over. We were doing all we could think of to help her through her latest osteoarthritis flare-up, but at 12 years old we thought maybe she had finally gotten to the point where she had to give in to her old age and slow down. *Disclaimer: This post contains affiliate links. If you order through these links we may receive a small commission, and we thank you! I’ve made it obvious how happy we are that I was wrong, because I can’t stop sharing in our recent posts about how active she has been lately! That made it seem like now was a good time to explain exactly what we are doing to manage her condition as best we can. Our golden retriever Sheba also has arthritis, though for a long while she was doing much better than Cricket. Lately we’ve had her on her highest dosage of medicine as well, because she was having difficulty getting up. I thought part of her problem might be weakness from the cancer, but she does seem to be doing better since her increase. Weight control – I believe this is one very important factor, and cannot stress it enough. Keeping dogs at a healthy weight is important for many reasons, but any extra weight is going to stress those damaged joints. Exercise – Sheba is especially stiff when she gets up, and I’ve seen both girls with a little more of a limp after sleeping. Getting them moving is important to keep the joints loose. Low impact exercise like walking is ideal, but if Cricket wants to run and play ball we let her. They go outside several times a day in the yard, and I take them for short walks when I can. Cricket’s back paw was turning over and scraping so walking was really challenging with her for a while. Now that we got her boots, she is getting around much better. You can read more about her boots in this post. Sheba walks pretty slowly these days. I try to keep to mostly level areas, or just slight hills. We have a lot of that terrain around our property and up our roads so it works out great. They loosen up those joints without overdoing. We tried Dr. Buzby’s Toe Grips – We didn’t have success with these for Cricket. Getting them on her was so much work because she wouldn’t stay still, and then they wouldn’t stay on. We were faced with the only possibility to be super gluing them on, and I just didn’t feel taking the time to do that was going to be ultimately good for Cricket. Trust me, the two minutes it takes to get her boots on her are about all the stress she (or I) can take. We got a full refund (minus the shipping) from Dr. Buzby’s even though we didn’t even have all the grips. You literally have nothing to lose but some time by trying these. Plus I know of other dogs that they have worked for. For us, throw rugs around the house (we have almost all wood and tile floors) and stairs* to the high furniture were the way to go (ramps can work well too), especially if you consider that we don’t just have one dog with joint issues. Not only is it the two girls with arthritis but everything we do also benefits Luke with his luxating patellas. Cricket was not happy when she could not get up on the couch – it is the prime spot around here. Thank goodness we still had these stairs! This is a LONG hallway for slipping and sliding dogs. The rugs make all the difference. Throw Rugs – I started with places where we saw Cricket slipping the most. That started with runners in the hallway. I found ones I really liked – easy to keep clean, non-slip, and reasonably priced through a catalog called Improvements. On that same site I found some larger rugs at a clearance price for in front of both doors and in the dining room, and I also shopped for bargains at yard sales and on amazon. There are rugs at the bottom of the stairs from the bed and where Cricket eats in the kitchen. The rugs have been great for all the dogs, and especially Sheba. Sheba started having a lot of difficulty getting up off the wood floors, which is often her favorite place to lie. Now I think she is really learning that being on one of the rugs makes it much easier for her to get up. Medicines/Supplements – Both girls take Carprofen (generic Rimadyl). I don’t take giving meds lightly, because there are always side effects. We had both girls off them for a while, or at lowered doses, and we did that as much as we could. Now we must also consider their ages and other things going on. Our veterinarian requires periodic blood tests to check for those side effects, so we feel as comfortable as we can with that. The important thing is that we’ve seen much improvement when they are taking these. All of the dogs take joint supplements. We’ve tried different ones to find what worked best. Cricket and Luke take Dasuquin* and Sheba takes Wag Immune Care*. In addition, we try to choose foods with Omega 3’s which are great for helping to reduce inflammation in joints, and we supplement their meals with fish oil as well. Bonnie & Clyde’s* is our favorite. Alternative treatments – We don’t have a lot of options for this in our area, but some you could look into include massage, cold laser therapy, and chiropractic care. Swimming was the best for Sheba. I think not being able to do that any more, along with the colder weather, may be why she has been worse lately. We love living in a rural area, but the downfall is that we don’t have indoor places where dogs can swim or do underwater therapy nearby. Our biggest challenge with Cricket is finding the balance, now that she wants to play ball again, with letting her play like she wants, and not letting her overdo it. What’s most important to us is keeping her happy, and if playing ball is what makes her happy (and it is!) then we’re going to let her do it. We just try to put time limits on it so she doesn’t overdo. So far that’s been working well. That exercise helps to keep her weight down as well, and she is one tired girl at the end of the night. Most evenings after supper she goes straight to the couch and you can hear her snoring! That’s a happy dog. I believe that leading an overall healthy lifestyle and keeping our dogs happy are the biggest keys to managing any chronic condition such as osteoarthritis. Right now we seem to be finding that balance. Happy girls enjoying the snow! Do you have a dog with osteoarthritis? What are your favorite management strategies, if so? If not, do you give your dogs joint supplements? I wish we had started our girls on them before we started dealing with it, but we just didn’t know about them when they were younger. Shadow is starting to have trouble getting up, too – especially in the kitchen – so I think I’m going to have to start giving her the full dose again of the carprofen. Like you with Sheba and Cricket, I need to balance her comfort level with the side effects. And her yearly exam is due in February, so we’ll be able to check then. Meanwhile, plenty of short play breaks – outside and in – and Cosequin DS twice daily and a gentle massage from me. I need to find a supplement for Ducky, too, just to be on the safe side. I’ll talk to the vet about it next time we go in. I think it’s a great idea to get Ducky on a supplement now. I actually can’t believe what a difference the full dose of carprofen has made in both girls. Massage is such a great idea too, I really need to start doing that as well. Thanks for all this great information and tips. Nellie has steps to get into bed but she won’t use them so I suggest for some dogs teaching them to use them when young will hopefully help when the are old. That’s a great idea, and something I never thought of until Kobi started to have trouble jumping. But that did start Cricket and Sheba early (and Luke too) with the stairs so they were already used to them when they really needed them. Sheba took a LONG time to use them. In fact, I had given up on getting her to use them, and then one day she started doing it on her own! Our dogs take supplements that we learned of at a training seminar. The selling point was the pro trainer said he noticed that dogs recovered more quickly from exercise. These are field trail dogs that run and swim for multiple marks 400-500 yards long. That was all we had to hear so we tried it and it has worked well for our dogs, especially the seniors. Exercise is important too and unfortunately that has dropped off this fall with lack of hunting. 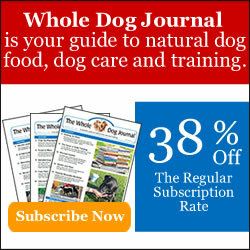 I never even thought of how great supplements could be for active dogs. In fact, I wish I’d known, because Cricket has been intense about playing ball her whole life, and I wonder if we’d had her on them sooner if things might be easier for her now. One thing I’ve found with Sheba which is kind of weird – she pokes along if we walk on the road, but if we’re in the woods, she seems much more motivated! Maybe the woods are more interesting, I don’t know, or maybe the trails are more comfortable for her to walk on. You’re doing an amazing job managing everyone’s joint issues. We did the same things for our Golden Retriever – weight control, moderate activity, covering the wood floors, and Rimadyl. He needed firm beds or he couldn’t get up. He’d get stiff in cold weather, but also if he laid on one side for too long. Our hall is very long (4 of those carpets you’re using might cover it) so we purchased carpet runner off the roll from the big box hardware store to cover the entire length seamlessly. We used a ramp into the car for a long time, but even that got too hard for him so the hubby would lift him in & out. Those toe grips are interesting. We would have been fishing them out of Bentley’s poop! I wonder if they’ll come up with something like Soft Claws for cats that can be glued on and would last a couple weeks. What a great idea to purchase the carpet runner! I’ll keep that in mind when these rugs wear out. I’ll also keep that in mind about firmer beds. I’d like to get some kind of orthopedic one, but they can be pricey, and Sheba would probably just lie on the floor or rug anyway. You are doing such a fantastic job with your crew. I need to get some steps for Bentley to help him get on the couch. I love the Bonnie & Clyde’s fish oil too. Wally has a little arthritis in his back legs. He was getting Cosequin and some other supplements. But the mom has a hard time giving it to him since he doesn’t like stuff mixed into his foods. They are all so lucky to have you helping figure out what works best. Bravo everyone! I’m feeling their pain–between wind chills of -12 yesterday and a road that’s been a complete sheet of ice for almost a week now, Barley and I haven’t gotten out for many walks and I’m the one that’s been a little stiff when I’ve gotten up in the mornings! I’m glad you’ve found so many good ways to manage their arthritis! I hear you, Beth! I can really feel it in the morning when I’m not exercising. We had a couple cold days and time outside was limited. Now we just got a bunch of rain after more snow, and the temps are going to plunge again. Everything will be a sheet of ice. Ugh. I was hoping we’d have a better winter this year. Little Roxy has her ups and downs with her arthritis. She was not feeling very good recently, having a hard time walking even. Part of it was the luxating patella too. She gets a half dose of rimadyl, so I started giving her another 1/2 in the evening. This helped her get through the bad spot, and now she is doing better. I have only found one glucosomine supplement she can take, that doesn’t contain shellfish. When I tried to order some though, it was a bit of a nightmare and we didn’t get any. Our vet kind of told us that once the damage is done, the supplements are only going to help so much anyway. We keep giving them, but I think it’s the pain relievers that are really doing more at this point. Exercise is so important, and if they are used to walking and playing they still want to do it. Katie would sometimes want to take longer walks. Mom knew it was too far for her, but they would go a longer distance anyway, and sometimes Mom had to carry her 75 pounds a few blocks home. It made Katie happy and that is what was most important…and Mom doesn’t need to worry about arm mucscles! Oh my gosh, Emma, your Mom is so strong and in such good shape! I’m not sure I could carry Sheba, and I almost had to try it with Luke the other day when the cold was bothering his paws. At least Cricket is only 22 pounds, so I can pick her up!